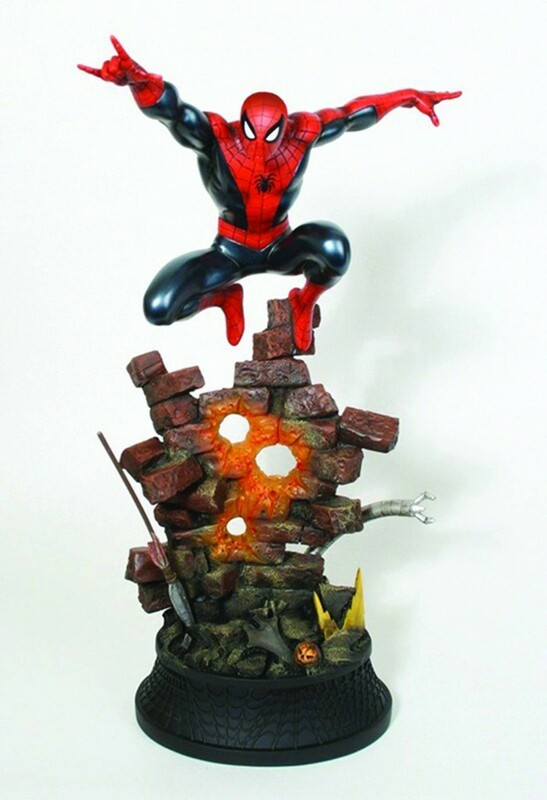 The Spider-Man Action Statue from Bowen Designs is now available. Spidey leaps into action! The trophies of his enemies lay below him as Spider-Man jumps into a new battle, webs ready to go! The artifacts included on this statue are the Green Goblin’s pumpkin bomb, Electro’s mask, Doctor Octopus’s mechanical arm and Kraven the Hunter’s spear. The devastated wall Spidey’s leaping from is crumbling beneath him, with giant holes burned through it, possibly from the Goblin’s bombs. The base of the statue is wrapped in the wall crawler’s web. This classic Spider-Man statue is sculpted by Randy Bowen and stands 15″ tall.